Steven (Chicagoland, United States) on 18 March 2019 in Plant & Nature and Portfolio. Flamingo flower spotted at the Garfield Park Conservatory in Chicago, Illinois. These are always so fascinating! I had one that bloomed once and never again :-( I like your composition for this! 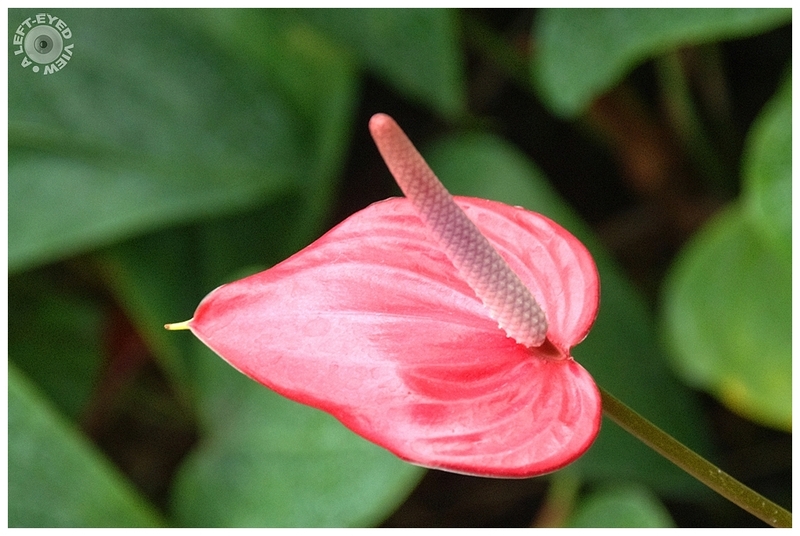 what a beautiful capture of this pretty flamingo flower! How aptly named and shown, Steven. C'est une petite fleur que j'aime beaucoup ! Very nice presentation from the flower. On this moment whe have 5 flowers in this plant at home. Elle est très belle et se dresse avec fierté. Très jolie et bien photographiée. Did you see the white variety too? Magnifique.... couleurs peu communes, je connais le rouge brillant et le blanc. Beautiful color and detail. These flowers remind me so much when I lived in Hawaii as a child. Joli gros plan de cette superbe fleur. A gorgeous image of this lovely flower. Magnifique fleur qui surgit dans l'écran avec audace ! These flowers that you are posting are often found in the tropics. It's fun putting names to them that I never knew. Thank you!